If you want to run a simple Excel export where each response is on one line, then you would run a standard Excel export. To set up a Flat Excel export, just go to the Responses page & mouseover Export, click to Export Settings and then choose Excel. A Flat Excel export expects there to be one line for each response. You can fully customise this export to suit your needs with our easy to use online builder - download example. In the online builder, you can choose which components are to be exported and which columns should be displayed. Modified to Web Account - When the response was last modified in the admin account (usually when the response was submitted by the app). Created in App - When the response was created in the app. Question Name - Name of the question selected for the export row. Answer - What the user answered in the app. Calculated value - In case of dropdows, single or multiple answer type of questions. You can also “Set Values” and then assign a value to each answer. This value is then exported. 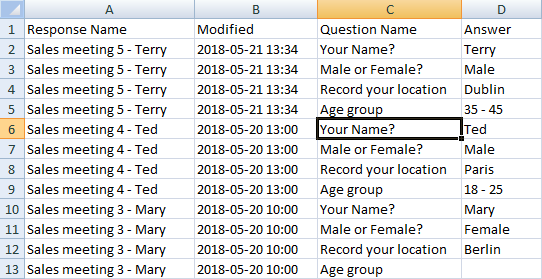 Specific per cell - You can choose a different name for the answer in each row. Custom GPS 2 Columns specific per cell - If you prefer to separately display GPS latitude and longitude in export in individual cells. Custom text content that is not within the response - Lets you specify the free text content that was not entered in the response (usually some type of note). When you set this field, just mouseover and click to settings and then enter your text in the “Content” input. When you save this page, all changes are applied immediately, so you can easily run an export on your existing data to review your results. You can download either an xlsx or cvs file when running a Flat excel export in the Reports page.